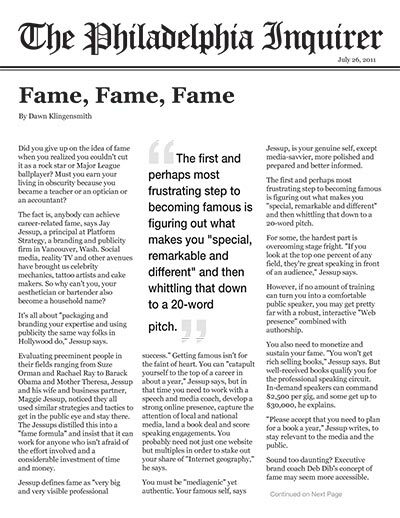 Did you give up on the idea of fame when you realized you couldn't cut it as a rock star or Major League ballplayer? Must you earn your living in obscurity because you became a teacher or an optician or an accountant? The fact is, anybody can achieve career-related fame, says Jay Jessup, a principal at Platform Strategy, a branding and publicity firm in Vancouver, Wash. Social media, reality TV and other avenues have brought us celebrity mechanics, tattoo artists and cake makers. So why can't you, your aesthetician or bartender also become a household name? It's all about "packaging and branding your expertise and using publicity the same way folks in Hollywood do," Jessup says. Evaluating preeminent people in their fields ranging from Suze Orman and Rachael Ray to Barack Obama and Mother Theresa, Jessup and his wife and business partner, Maggie Jessup, noticed they all used similar strategies and tactics to get in the public eye and stay there. The Jessups distilled this into a "fame formula" and insist that it can work for anyone who isn't afraid of the effort involved and a considerable investment of time and money. Jessup defines fame as "very big and very visible professional success." Getting famous isn't for the faint of heart. You can "catapult yourself to the top of a career in about a year," Jessup says, but in that time you need to work with a speech and media coach, develop a strong online presence, capture the attention of local and national media, land a book deal and score speaking engagements. You probably need not just one website but multiples in order to stake out your share of "Internet geography," he says. You must be "mediagenic" yet authentic. Your famous self, says Jessup, is your genuine self, except media-savvier, more polished and prepared and better informed. The first and perhaps most frustrating step to becoming famous is figuring out what makes you "special, remarkable and different" and then whittling that down to a 20-word pitch. For some, the hardest part is overcoming stage fright. "If you look at the top one percent of any field, they're great speaking in front of an audience," Jessup says. However, if no amount of training can turn you into a comfortable public speaker, you may get pretty far with a robust, interactive "Web presence" combined with authorship. You also need to monetize and sustain your fame. "You won't get rich selling books," Jessup says. But well-received books qualify you for the professional speaking circuit. In-demand speakers can command $2,500 per gig, and some get up to $30,000, he explains. "Please accept that you need to plan for a book a year," Jessup writes, to stay relevant to the media and the public. It's still not easy. Executive Power Brand, her New York-based consulting firm, warns on its website that preparing to join the ranks of the esteemed elite is an "intense, months-long" process. There's a price for fame, of course. Personal branding specialists like Dib charge $200 to $500 per hour; a basic tune-up starts at $2,500. Platform Strategy will build a powerful national brand for a fee of $4,000 a month for individuals. This includes multiple websites, professional photos, a book deal, media training, speech training, image consulting, branding strategy, full publicity "and other situation-specific services required to brand, package, publicize, and sell someone's expertise and train them to present their best authentic selves," says Jessup. Being famous is not the same as being universally liked, warns Dib: "Really strong brands attract and repel - think of Oprah, Trump, Obama." Or Rachael Ray, she of the 30-minute meals, whose haters are notoriously vocal and regard as failings the very qualities and quirks that endear her to her fans.